Three out of four Arizona toddlers are getting a recommended series of vaccinations, according to the Centers for Disease Control and Prevention. Arizona ranked slightly above the national average and 22nd among other states and the District of Columbia in the U.S. National Immunization Survey, with 76.4 percent of children between 19 and 35 months receiving the full series. The vaccinations protect against measles, mumps and rubella, Hepatitis B, polio, chicken pox and tetanus, diphtheria and pertussis, often referred to as whooping cough. The survey, released in late August and covering 2008, showed Massachusetts with the highest percentage of toddlers getting the full series of vaccines, at 82.3 percent, and Montana with the lowest, at 59.2 percent. The national average was 76.1 percent. Arizona’s actual percentage could be significantly higher or lower because the survey had a margin for error of plus or minus 6.3 percentage points for the state. The CDC has a goal of 90 percent of toddlers receiving each immunization in the series. Arizona and the nation overall met that goal for everything but a four-part vaccination set against diptheria, tetanus and pertussis. Arizona’s percentage for that set was 84.6 percent, which was right at the national average and 24th among states and District of Columbia. Debbie McCune Davis, program director for the Arizona Partnership for Immunization, a nonprofit statewide coalition, said failing to finish vaccinations for diptheria, tetanus and pertussis is especially troublesome when it comes to whooping cough, which is much more severe for young children. “It’s seemingly harder to get children finished with the complete series but extremely important because the first shot is just as important as the fourth,” said McCune Davis, who also serves in the Arizona State Senate. Ralston-King said it’s tough for some parents to follow through with those particular vaccinations because they require multiple visits. CDC records show that Arizona’s percentage of toddlers receiving the full series of vaccinations has improved fairly steadily since 2002, when it stood at 59 percent. Ralston-King said one reason for the improvement is the state’s Immunization Information System, under which Arizona law requires providers to report all immunizations administered to children. The system helps public and private health care providers, parents and guardians know when children are due for shots. 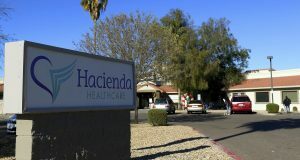 The Department of Health Services also offers a Vaccines for Children Program, which provides free vaccines to more than 800 health care providers for children covered under the Arizona Health Care Cost Containment System, the state’s Medicaid system, as well as uninsured and under-insured children and Native American children. Ralston-King said the state will continue working to increase the percentage of children receiving vaccines. Those heading to Mexico for the holidays can expect longer waits at the border due to stepped up inspections, and federal officials say travelers can make things easier by having legal documents ready and accurately completing customs declarations.